This design was part of the original series of forty-eight designs completed by October 1931 and is currently not known from later printings. This is one of five designs featuring varieties of dahlia in the primary series, all with identical title-captions. 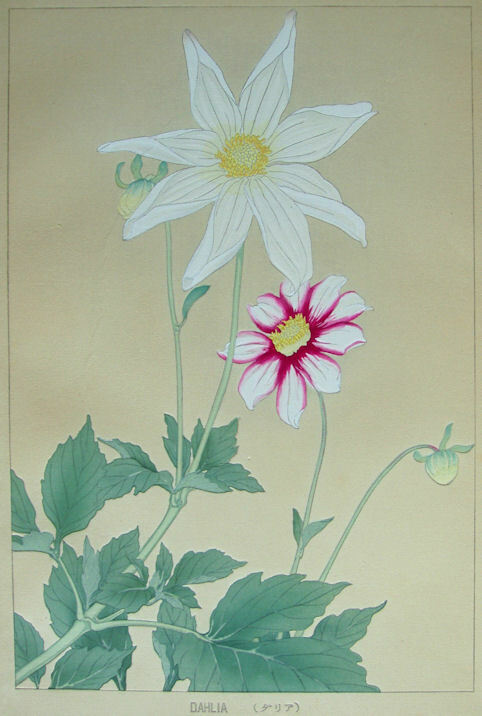 There is also a corresponding dahlia design in the Hodo/Takemura Floral Series (see below). Dahlia, Dahlia hybrid cultivars; The dahlia also has a Japanese name, 天竺牡丹 tenjikubotan, lit. 'Indian peony'. For additional dahlia designs in the primary Rakusan series see 94.